At the quiet end of Orchard Road, Traders Hotel Singapore offers elegant rooms with free internet. 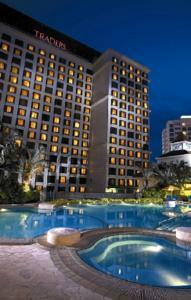 Aside from a 24-hour gym, it has an outdoor pool and pampering spa services. Traders Hotel provides a free shuttle service to Orchard Road, as well as weekday morning shuttles to the central business district. It is a 15-minute walk from major malls like ION Orchard and Wisma Atria. Overlooking beautiful grounds or the city, rooms at Traders Singapore are equipped with a satellite TV and minibar. Private bathrooms come with premium toiletries, bathrobes and hairdryers. Guests can enjoy massage treatments at the spa or simply relax at the sauna and steam rooms. The hotel also provides a business center and laundry services. Ah Hoi's Kitchen serves local dishes, while Cafebiz offers a buffet spread of Asian and international food. For light refreshments there is Cafebiz+ or Rumpoles Bar for beers, cocktails and wine. Rooms: Hotel Rooms: 546, Hotel Chain: Shangri La. Free! Wired internet is available in the hotel rooms and is free of charge. Free! Wi-Fi is available in all areas and is free of charge. Free! One child under 12 years stays free of charge when using existing beds. Free! One child under 2 years stays free of charge in a baby beds. The maximum number of extra beds/baby beds in a room is 1. Any type of extra bed or crib is upon request and needs to be confirmed by management.